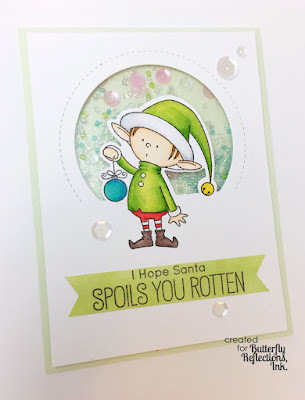 For my card today, I reached for this cute MFT Santa Elves set with its matching dies. I love coloring this cute elf. He's just so adorable! To make the shaker card, I used MFT Die-namics Peek A Boo Circle Windows and did partial cutting and apply the same partial cutting with the elf dies as well. Here's a close up look oft he shaker part. 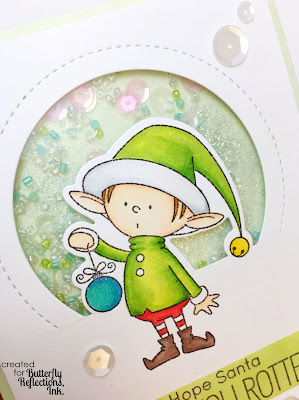 Finished by adding shimmer to the ornament and the hat's bell with Spectrum Noir Sparkle Pen and some pretty sequins. Well peeps, that's all from me today. May your weekend be filled with things that brighten and lift up your spirit. Did you use Copic markers? Would you mind sharing which colors? Wonderful image beautifully colored! This is a terrific card. Thank you for sharing it.